This Chicken Mushroom Gravy Recipe is everything a hearty gravy should be! 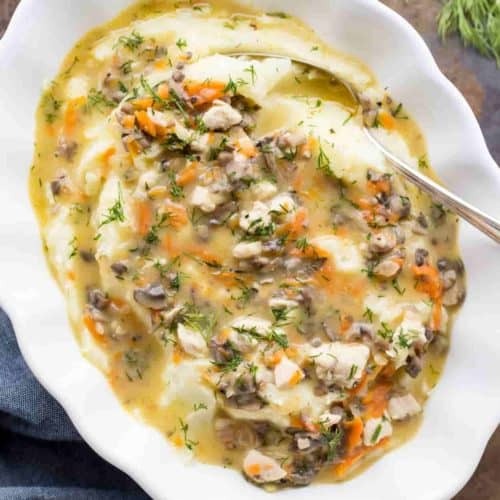 Chunks of chicken in a delicious mushroom and vegetable gravy. The gravy may be served over mashed potatoes as a side or enjoyed as a meal with an amazing salad! In a Ukrainian home, a hearty gravy was served over mashed potatoes at most family gatherings. This chicken gravy recipe brings back so many memories from my childhood. 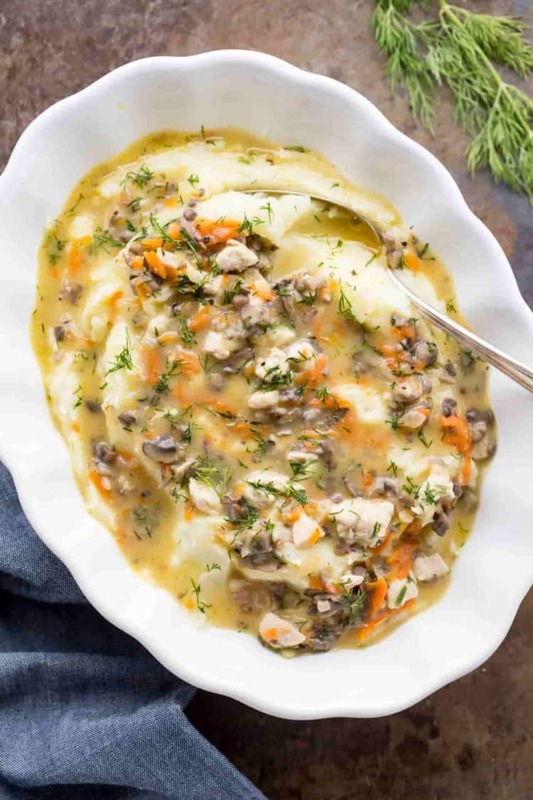 Though I didn’t like mushrooms back then and enjoyed my mashed potatoes plain, I remember my mom always making this amazing gravy for parties and it would make all the adults really happy – really happy! 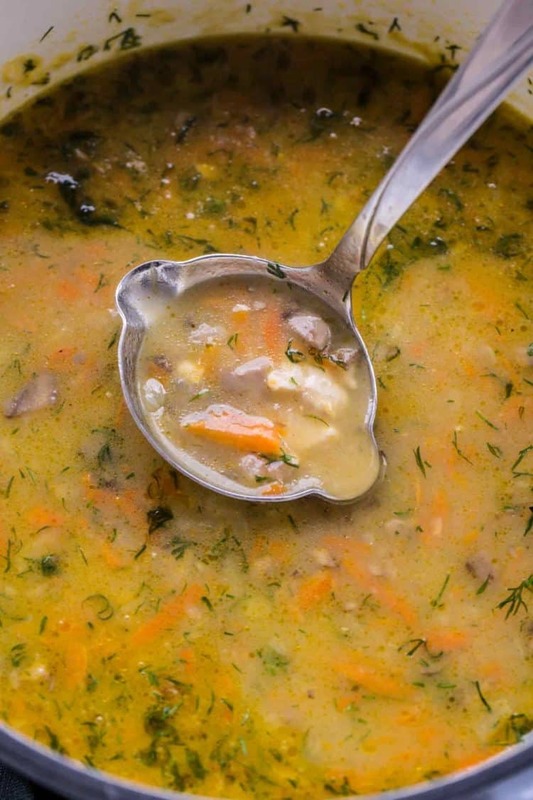 The combination of chicken and mushrooms with carrots and fresh dill is absolutely delicious. Cut chicken into small, bite-sized pieces. Finely chop mushrooms, grate the carrot, finely chop the onion! TIP: To enjoy the gravy as a meal, cut the chicken into larger pieces and slice the mushrooms instead of finely chopping them. NOTE: If you love VEGETA seasoning as much as I do, season the gravy with part salt and part Vegeta. SOO GOOD! Over medium heat, add the broth and water to a medium pot, bring to a light boil. Take out 1/3 cup of the liquid and set aside. In a skillet, saute chicken and add to the pot, turn the heat down to a light boil. In the same skillet, saute mushrooms. Add sauteed mushrooms to pot. In the same skillet, saute onions with the carrots. Add the 1/3 cup liquid that was removed from the pot and flour and mix vigorously. Add to pot with remaining ingredients. Season with salt, pepper and add fresh dill. Allow the gravy to thicken at a low simmer. This gravy may be served over your favorite side. Mashed potatoes, rice, egg noodle or buckwheat are all great with this mushroom gravy. Yes, this gravy may be made a day in advance. When reheating the gravy, reheat it on low/med heat not to scorch the pot. If the consistency is too thick, add a few tablespoons of boiling water. Vegetable Chicken Stroganoff Recipe– so good with pasta. Chicken Mushroom Marsala Gravy– chicken + mushrooms, the perfect combination. Meaty Gravy– so simple to make. This Chicken and Mushroom Gravy Recipe is everything a hearty gravy should be! 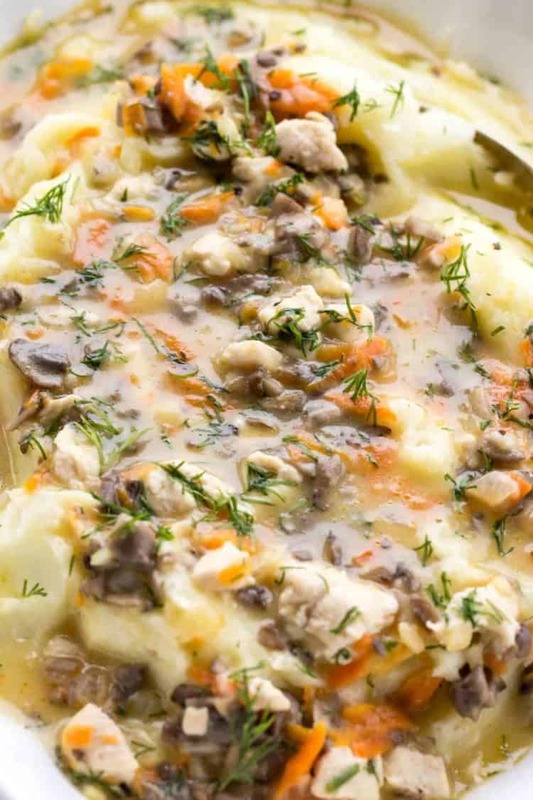 Chunks of chicken in a delicious mushroom and vegetable gravy. 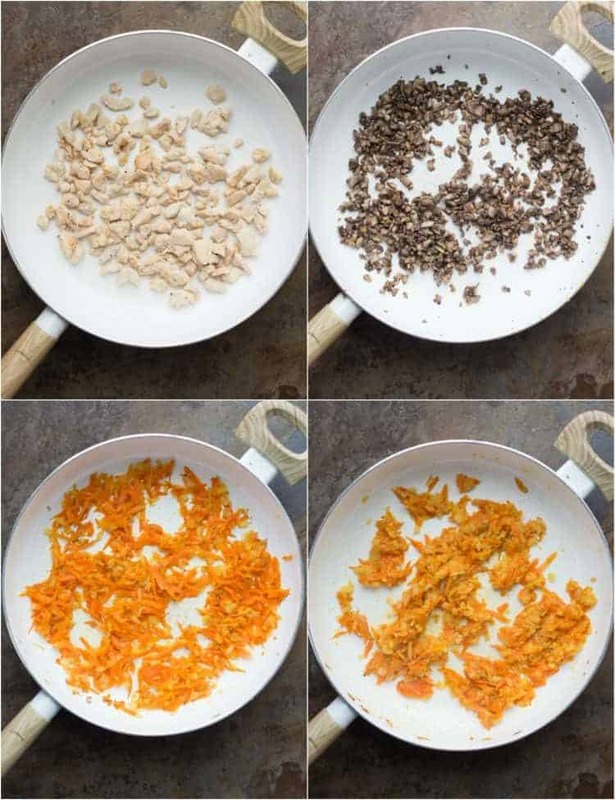 Finely chop the onion, grate the carrot, cut chicken in small pieces and chop the mushrooms the same size as the chicken. In a skillet, heat 1 tsp oil. Saute chicken until cooked. Season lightly with salt and pepper. In a medium pot, over medium heat, combine the water with chicken broth, bring to a soft boil. Remove 1/3 cup of liquid and set aside. Once the chicken is cooked, at it to the pot. Turn heat down to a soft boil. In the same skillet, over med/high heat, saute mushrooms with 1 tablespoon butter until browned. Lightly season with salt and pepper. 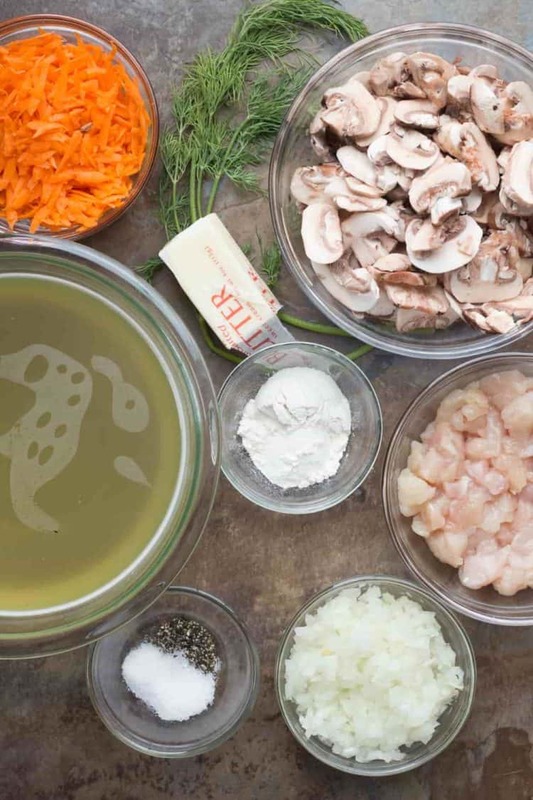 Add mushrooms to pot with chicken and broth. In the same skillet, cook onions over medium heat with 1 1/2 tablespoons butter until tender. Add carrots and remaining butter. Cook until carrots are tender, stirring as needed. Once carrots are tender, pour the reserved 1/3 liquid into the skillet and stir. Slowly add flour and mix vigorously. Once flour is incorporated, add veggies to the pot. Stir well. Add the fresh dill, salt and pepper. Simmer for a couple minutes until gravy thickens. I made this gravy and it came out really good! Thanks so much for sharing, Olga! So glad to hear that. Have a most blessed Thanksgiving weekend. Is it supposed to be very watery? Thank you for this easy delicious dish my who familiy absolutely LOVES it!!! Valentina, I made this dish for my hubby and baby yesterday he absolutely loved it! And hubby is a veryyy picky eater…So if he loved it must be more than EXCELLENT 🙂 Thanks again! Mary, how wonderful!. So happy to hear you approve and hoping your guests will as well. :) Have a good time..
Lanka! That’s a great feeling, rather delighted I was able to tempt you, hehe:) :). How much mushrooms shud I add? Thanks much for the feedback!.